Dr. Matthias Henze (Rice University) delivers a lecture on the topic, “In the Company of Angels: The Resurrection of the Dead in Early Judaism and Christianity,” recorded at Trinity University on March 2, 2017 (lecture begins at 4:36). Jews and Christians share the belief that at the end of time God will raise the dead and make them live again. Some early Jewish and Christian writers went even further and anticipated a life among the angels. What do we know about the origin of this belief? The hope for the resurrection of the dead did not originate with Christianity, as is often claimed, but has deep roots in ancient Judaism. This talk will trace the origins of the belief in the resurrection from the Hebrew Bible/Old Testament through Judaism of the Second Temple period into the New Testament. Only when the New Testament texts about the resurrection are read side by side with the ancient Jewish texts about the end of time can we fully appreciate what the two religions have in common and where they differ. On February 23, 2016, the Trinity Western University (TWU) Dead Sea Scrolls Institute hosted a series of talks on the Dead Sea Scrolls, “Re-Imagining the Scriptural Past in the Dead Sea Scrolls”. 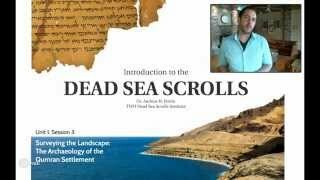 The Dead Sea Scrolls provide fresh perspective on both the words of the Hebrew Bible/Old Testament and ancient Jewish world of the New Testament. As the library of a specialized Jewish scribal community, they also reveal how ancient people and communities rendered their religious traditions relevant to their own culture. Many readers of the Bible today face this same task: scripture is at once ancient and sacred, yet its contemporary relevance is not always evident. Through presentations and discussions with four TWU alumni and authors of recently published books on the Dead Sea Scrolls, our evening will explore how the group that penned and preserved the scrolls navigated this dynamic in their own search for meaning. Join authors Dr. Andrew Perrin, Dr. Kipp Davis, Dr. Marvin Miller, Dr. Dongshin Chang, and Dr. Peter Flint as they detail how ancient writers encountered and innovated the biblical past by extending prophecy, claiming revelatory dreams, rethinking covenant theology, and crafting and circulating letters. Dr. Peter Flint – The Dead Sea Scrolls: What Can They Teach Us? Dr. Peter Flint (Canada Research Chair in Dead Sea Scrolls Studies at Trinity Western University) provides a fresh introduction to the Qumran texts and archaeology in light of his recently published book “The Dead Sea Scrolls” (Abingdon, 2013). Dr. Andrew Perrin (Assistant Professor of Religious Studies at Trinity Western University) explores the rewriting of apocalyptic history in the book of Daniel and ancient Judaism in light of his recently published book “The Dynamics of Dream-Vision Revelation in the Aramaic Dead Sea Scrolls” (Vandenhoeck & Ruprecht, 2015). Dr. Kipp Davis (Scholar in Residence at Trinity Western University) details the cultural and literary development of famed figures today and in antiquity, with an eye to the prophet Jeremiah’s life beyond the Bible. A detailed treatment of the Jeremiah traditions in the Dead Sea Scrolls may be found in his recently published book “The Cave 4 Apocryphon of Jeremiah and the Qumran Jeremianic Traditions: Prophetic Persona and the Construction of Community Identity” (Brill, 2014). Videos are available of some of the speakers at the Evil in Second Temple Judaism and Early Christianity conference, St Mary’s College, Twickenham, May 23-24, 2014. The Online Critical Pseudepigrapha (OCP) provides open-access, online critical editions of various Jewish and Christian pseudepigrapha. OCP is a publication of the Society of Biblical Literature (SBL). Professor Michael Satlow, of Brown University, offers a complete set of lectures on early Judaism (recorded 2011), available for free download on iTunes. The course, “From Israelite to Jew” covers the exile, return from exile, Persian, Hellenistic, and Roman periods, including Philo, the Dead Sea Scrolls, and the destruction of the Temple. Professor Michael L. Satlow specializes in Early Judaism and has written extensively on issues of gender, sexuality, and marriage among Jews in antiquity, as well as on the Dead Sea scrolls, Jewish theology, methodology in Religious Studies, and the social history of Jews during the rabbinic period. His latest book is entitled Creating Judaism.